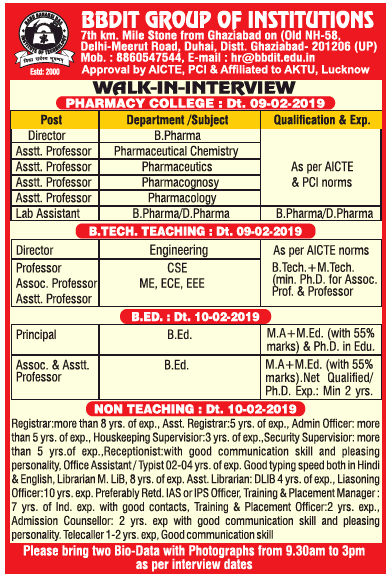 BBDIT Group of Institutions, Ghaziabad has advertised in THE TIMES OF INDIA newspaper for the recruitment of Teaching Faculty- Professor / Associate Professor / Assistant Professor / Director / Principal Plus Non-Faculty jobs vacancies. 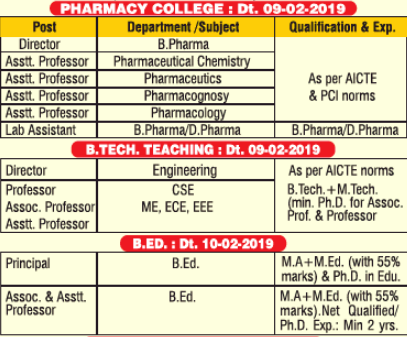 Interested and eligible job aspirants are requested to walk-in on 09th and 10th February 2019. Check out further more details below. About College: BABU BANARSI DAS INSTITUTE OF TECHNOLOGY one of the fast-developing Institutes in the field of Engineering and Management, was established in the year 2000, under the aegis of RAJIV EDUCATIONAL TRUST with a vision and avowed objective to provide contemporary and quality education in the areas of Engineering & Management. Interested and eligible candidates are requested to attend the Walk-in interview along with 02 copies of CV, copies of certificates and recent passport size photos to the walk-in address given below.